Heat oven to 375°F. In medium bowl, mix 1/2 cup butter, 1/3 cup sugar, the milk, vanilla and salt with spoon. Stir in 1 1/3 cups flour. Divide dough into 24 equal pieces. Press each piece in bottom and up side of small muffin cup, 1 3/4x1 inch, ungreased or lined with paper baking cups. In medium bowl, mix cream cheese, 1/4 cup sugar, 3 tablespoons flour, the egg yolk, orange peel and orange juice. Spoon slightly less than 1 tablespoon mixture into each cup. Sprinkle with coconut. Bake 15 to 20 minutes or until pastry is light brown around edges and filling is set. Cool slightly; loosen from cups with tip of knife. Remove from pan to wire rack. Cool completely, about 1 hour. Top with citrus peel just before serving. Store covered in refrigerator. 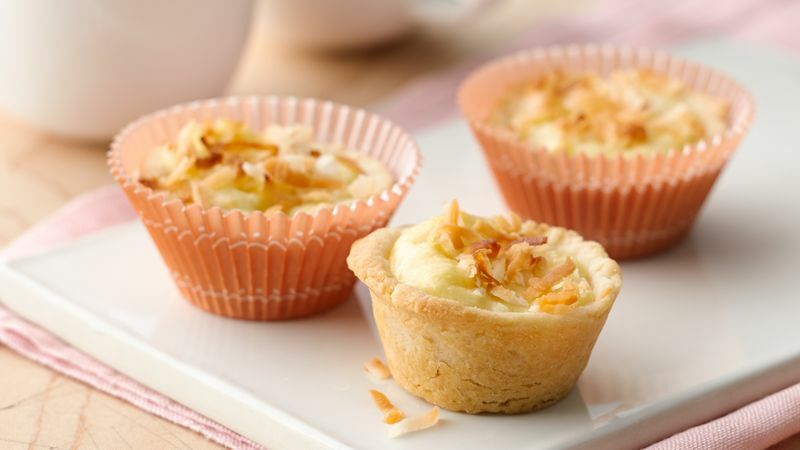 You can make the tart pastry, press it into the muffin cups and freeze in the pan up to two months. Thaw before adding filling and baking. Cut mini stars out of fruit rind using a canapé cutter.